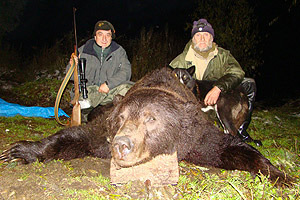 We are now able to offer a brown bear hunt on the famous Kamchatka Peninsula right in the middle of the salmon spawning season from September 28th thru to October 20th. Can you imagine anything more exciting than stalking salmon filled rivers for huge coastal brown bears! Day 1: Arrive in the capital Petropavlovsk- Kamchatsky. Meet and greet by outfitter then overnight in hotel. Day 3 to Day 8: Hunting is done by traveling upstream around 20 klm then drifting back and glassing for a large male trophy bear. During this time you are able to fish for Arctic char and silver salmon if you wish. Most of the action is encountered in the evenings when the bears are gorging on fish in the spawning grounds. Day 9: Leave camp and transfer back to Petropavlovsk- Kamchatsky then overnight in hotel allowing time for documentation and packing of your trophy. This hunt is also available in spring with the use of snowmobiles and at the same cost.